Annuals and perennials that you purchase at the garden store or nursery come to you from the protected environment of a greenhouse. to prevent them from getting sunburned. then move them around to gradually increase the amount of sun they receive each day. to avoid the heat of the midday sun and prevent undue shock to the plant. the plants were set around the planting area, while still in their pots. After a bit of pondering, each was placed in the approximate location where it would be planted. and color were considerations in these decisions. 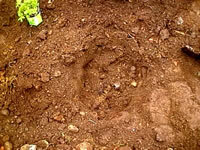 A hole is then dug in the prepared garden area, three times the width of the pot, and twice as deep. was added to the original soil from the hole. leaving enough room in the center for the root ball. 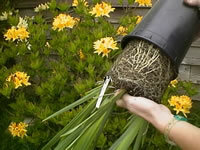 Remove your plant from it's pot by placing the hand over the root ball to support it, and inverting it. Give the pot a couple sharp raps with the trowel handle to loosen the roots. The container can now be lifted from the plant. Because the roots had grown out and compacted against the pot, it was necessary to 'feather the roots' out. Using your fingers to gently pull the surface roots away from the root ball will induce the roots to once again grow outward. and bottom of the root ball, using a sharp, clean knife. Prune off any severely damaged roots prior to planting. Avoid damaging and stressing your plants! Never remove them from the pot by pulling them out by their leaves or stems. the best side is "faced" in the direction it will be viewed from most often. 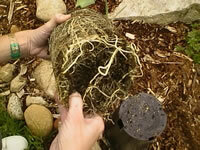 The plant is placed into the hole at the same depth at which they grew in the pot, and the remaining soil is added. 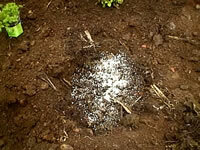 Water the plant thoroughly to insure that the soil fills in completely around each root. 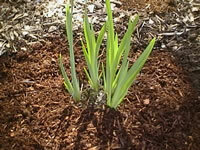 Mulch your new transplants with compost or some other organic matter to keep the roots cool and the soil moist. Set a garden stake in the hole if this is a taller plant which will need support to reduce wind and rain damage. The stem should be tied to their support using strong, stretchy materials that won't cut into growing branches. Strips of old nylon hosiery will work very well for this. Loop each tie into a figure 8, with the crossed portion between the stem and the support to keep stems from rubbing or being choked. (unless you plan to save the seeds). Take a little time each day to enjoy the beauty you have created. Gardening 101: Garden Basics: Zone maps, charts, guides and more. Gardening 101: Deciding what kind of garden you'd like to grow. Gardening 101: Preparing the planting site to grow your new garden. Gardening 101: How to sow and grow new plants from seed. Gardening 101: Planting and Growing a Vegetable Garden.